Warmer temperatures, thawing permafrost and melting sea ice and glaciers are changing the Arctic environment. Climate change is already having an impact on Arctic land, water, plants and animals, and the people living there are enduring the effects. But changes in the Arctic will also have global consequences. Since the Industrial Revolution of the 1800s, the combustion of fossil fuels – coal, oil and gas – have helped drive industry and advancement. These human activities have also led to the buildup of carbon dioxide and other greenhouse gases in the atmosphere – raising the global temperature. The Earth’s global temperature for September 2015 was 0.9C (1.62F) above the 20th-century average, making it the warmest September in 136 years of record keeping. The Arctic is warming at nearly twice the rate of the rest of the world. Arctic systems may soon be reaching tipping points – critical moments – that could further exacerbate global climate change. For example, melting sea ice would expose the dark ocean, which would absorb more sunlight and lead to further warming, or melting permafrost could lead to a large release of methane gas, which is 20 times better at trapping heat than carbon dioxide. Climate change, technology and the demand for new resources could open up the region to investment in shipping, fishing, mining and energy production. This greater level of human activity could have negative ecological effects, but it also presents new economic opportunities for local communities. The world’s oceans have absorbed much of the human-made carbon dioxide emitted into the atmosphere. This has slowed the pace of climate change that these emissions might have otherwise caused; it has also altered the water chemistry of the oceans. The world’s oceans are on average about 30 percent more acidic than they were two centuries ago. Cold oceans, like the Arctic Ocean, are acidifying more quickly because cold water absorbs more carbon dioxide than warm water. As the water becomes more acidic, it removes carbonate ions from the water that might otherwise be used by marine organisms to build their shells. New research shows that the acidity of surface waters of the Chukchi and Beaufort seas could reach critical levels by 2027, and the Bering Sea by 2044. If that happens, shell-forming marine organisms from small sea snails to Alaska king crab would have trouble building their shells, which could affect subsistence and commercial fisheries in the region. Some projections suggest that if carbon dioxide emissions continue to rise, the pH of the oceans could shift from the current level of 8.1 to 7.8 by the end of the century. 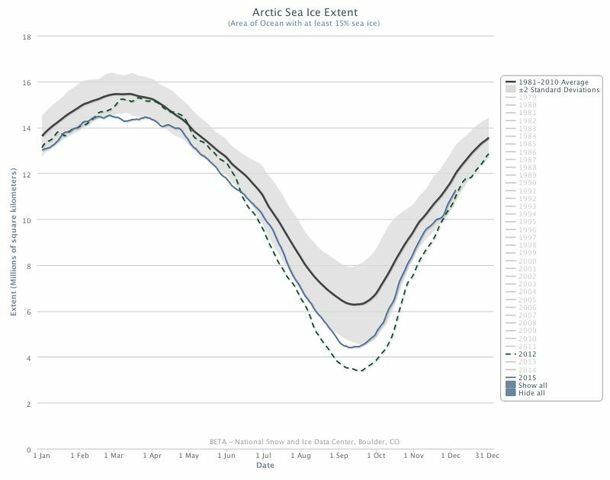 Warmer temperatures have melted Arctic sea ice to record lows in the past decade. At the end of the summer melt season in 2015, sea ice extent had declined to 4.41 million square kilometers (1.7 million square miles) – the fourth lowest extent since the satellite record began in 1979. 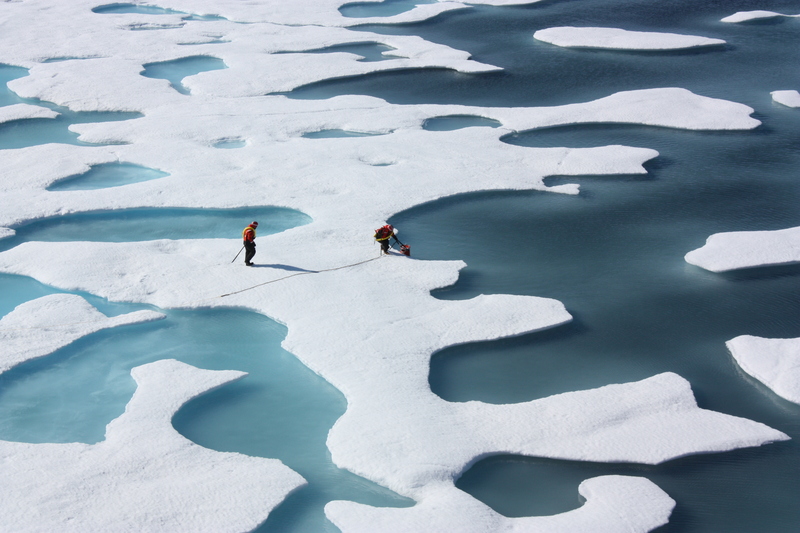 Many forecast the Arctic Ocean will be ice-free in the summer in a matter of decades. Its decline leads to the loss of habitat for seals and polar bears. It can push polar bears onto land where encounters between humans and bears could increase. The sea-ice retreat also exposes coastlines to wind-driven waves and causes coastal erosion. Some parts of Alaska, western Canada and Russia have already lost large chunks of land to the ocean where the permafrost has become unstable. Hundreds of thousands of people in the Arctic live in villages and cities that are built on permafrost, a thick layer of soil that remains frozen year-round. Frost-heaves and thawing permafrost have damaged buildings and other infrastructure such as roads, saddling communities with extra costs for repairs and rebuilding. Some communities have had to sandbag their shorelines to slow down coastal erosion. More than 1 trillion tons of carbon is stored in the permafrost globally. Thawing permafrost could release some of that carbon into the atmosphere, which might raise carbon dioxide levels by another 60 to 80 parts per million by the end of the century, in addition to the carbon dioxide and other greenhouse gases we emit from burning fossil fuels, farming and extracting natural gas. The blanket of ice over Greenland covers nearly 1.68 million square kilometers (650,000 square miles) and is 3km (1.86 miles) thick in some places. But this massive ice sheet is losing more ice annually than it gains during the winter snowfall. Large volumes of freshwater and ice are collapsing into the ocean. If all the ice on Greenland were to melt and gush into the ocean, global sea levels would rise about 7m (23ft). No one expects this to happen any time soon, but even a modest increase could cause serious damage to coastal cities. The scientists behind the Intergovernmental Panel on Climate Change estimate that global sea levels will rise 0.5–1m (1.6–3.2ft) by 2100, meaning many cities along U.S. coasts will have to deal with routine flooding. Climate change has already had an impact on Arctic terrestrial, freshwater and marine ecosystems. Many of the adaptations that Arctic plant and animal species have acquired to survive the harsh conditions also limit their ability to respond to warmer climates and other environmental changes. Wetlands make up about 11 percent of the terrestrial surface of the Arctic. They are the summer homes of millions of migratory birds, including the common eider that breeds in the Arctic and winters in more temperate zones. But wetlands – and other freshwater ecosystems – are vulnerable to warmer temperatures, changes in precipitation and thawing permafrost. Ponds and lakes can disappear if the permafrost beneath them thaws. The ocean occupies nearly two-thirds of the Arctic territory. 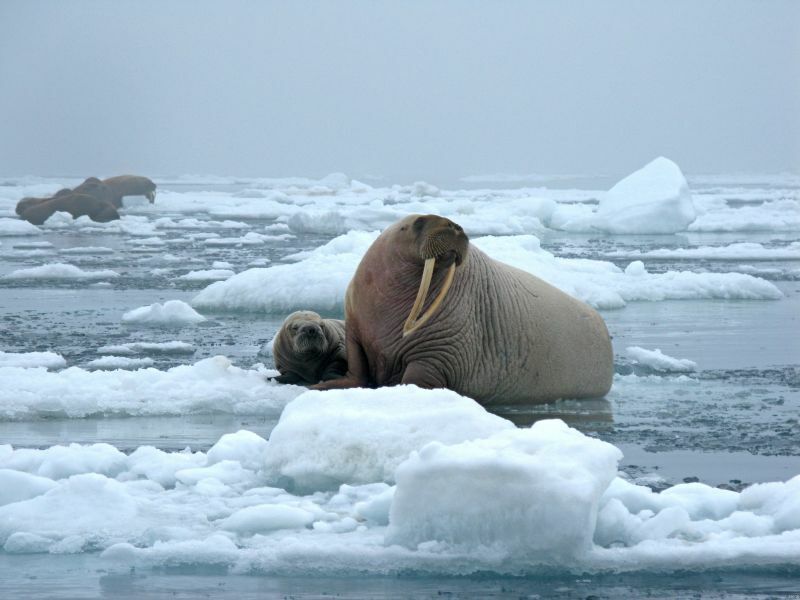 The sea ice provides important habitat for seals, walruses and polar bears on top of the ice, and for plankton production and plankton-eating fish that live beneath the ice. The marine ecosystem supplies food – fish and marine mammals – to northern coastal residents. But accelerated climate change is also releasing environmental contaminants, such as mercury, from permafrost zones into the marine environment, where they accumulate in food webs. Arctic communities are vulnerable to the effects of these toxins because they consume a lot of fish and marine mammals.